Nara is about a 1-hour trip from Osaka; we spent a nice day trip exploring the area. Nara Park is one of the oldest parks in Japan, and is home to over 1,200 wild deer that freely roam the area. These deer are considered national treasures and are protected by Japan. Deer crackers are sold for 150 yen all around the park. If the deer think you will feed them, they will come up to you and bow to ask for food. It’s quite an amazing sight to be surrounded by deer as you walk through the peaceful park. We grabbed a tasty set lunch at Wafuresutoranmiyama (that’s not a typo) restaurant. Located next to Nara Park, Todai-ji Temple houses an 18m (60ft) tall Buddha, one of the largest bronze statues of Buddha. The main hall is one of the largest wooden buildings in the world. Inside the temple, there are several other smaller Buddhist statues. The entrance fee to the temple is 500 yen. On the way back to the subway station, we grabbed refreshments at the Wata Wata Owl Café. This café houses several different types of owls, which were quite tame and friendly. We were allowed to pet almost all of the owls and feel their soft feathers. 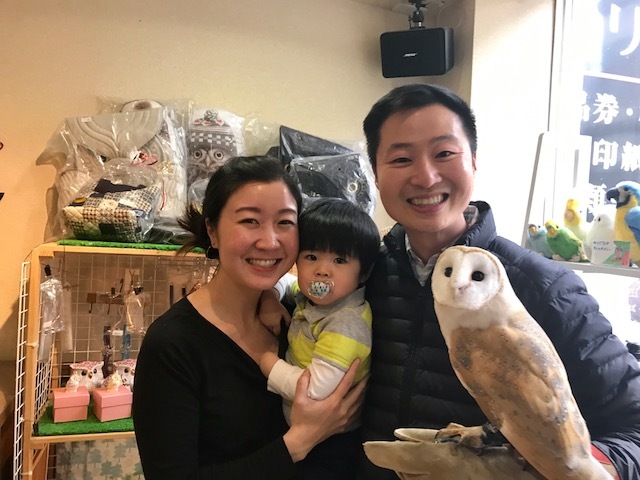 At the end of our visit, our group got to handle one owl. If you are ever visiting Kyoto or Osaka, it’s worth a short 1 hour trip to Nara to see the beautiful park and temples.